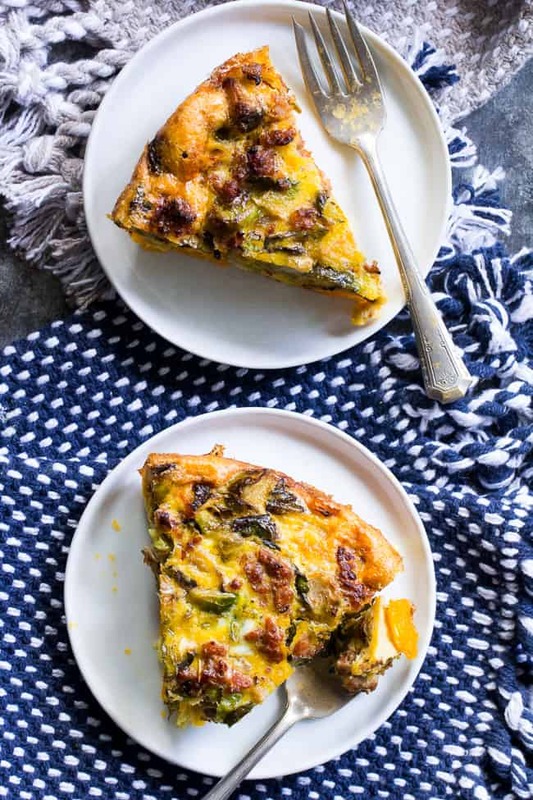 This paleo quiche has an easy butternut squash crust and is packed with sausage, veggies and tons of flavor. It’s Whole30 compliant and perfect for brunch or any meal. Great as a make-ahead breakfast, too! 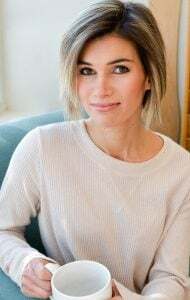 Truth – when I started paleo with my first Whole30, I practically LIVED on frittatas and egg casseroles. Why? Well, before I knew how to make a “hash” (HA! Such a staple now!) the only thing I could think to make for breakfast that was filling and tasted good was a frittata – usually a super simple one with ground meat and perhaps some broccoli or spinach to get the greens in. But, let’s just say those simple frittatas got really old really flipping fast. I needed more carbs, more flavor, more fun, in a major way. 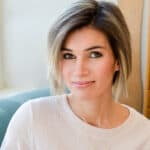 Since it’s not like I was about to quit paleo, I started exploring, and, while what I found wasn’t groundbreaking exactly, it changed the way I viewed paleo and opened up a big world of flavor and CARBS for me! Sweet potatoes (in all their delicious varieties), winter squash, plantains. I learned how to sautee/roast/bake them properly to bring out all that hidden flavor and started getting more creative with my breakfasts. 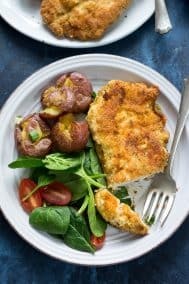 Sweet potato or butternut crusted quiches? Now we’re starting to get somewhere that I can actually live happily. Fast forward to when I started really making this blog all about the recipes, and it was clear that breakfast was a huge favorite for me. 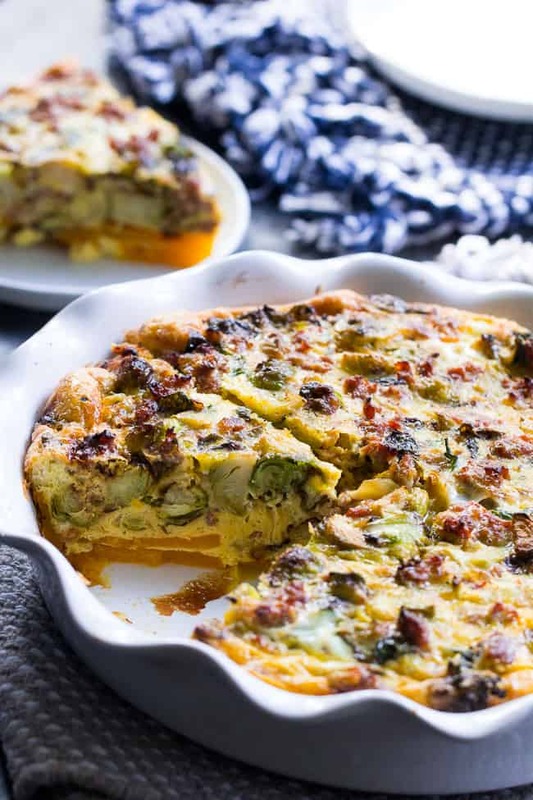 My paleo breakfast casserole is probably the number 1 reader favorite on the site, but I have several other similar recipes that use the same basic idea and method. I’m going to now officially add this Whole30 and Paleo quiche – with it’s easy roasted butternut crust (yay to seasonal eating!) 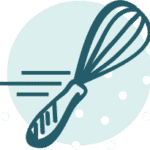 – to that group of make-ahead egg bakes, casseroles and quiches. 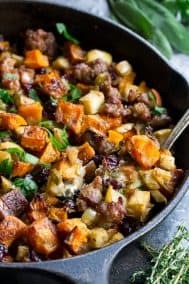 Packed with savory sausage, veggies, and a creamy flavorful egg mixture, it will hopefully change your view of breakfast if you’re stuck in a rut! Now, while this recipe is time consuming (I will not lie!) it’s not at all difficult. Because you’ll be roasting the butternut squash (in the pie dish) and the Brussels sprouts (on a baking sheet) the cook time is longer, but oh so worth it for that roasted veggie flavor in the final product. Don’t be afraid of the butternut squash crust, either – anyone can do this! You simply thinly slice the long part of your butternut squash, arrange in the dish with coconut oil and sea salt and roast! 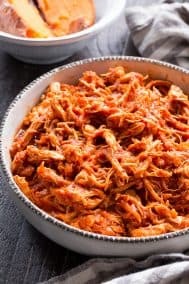 No need for perfection here, either, this is one of the most forgiving recipes on my whole site. 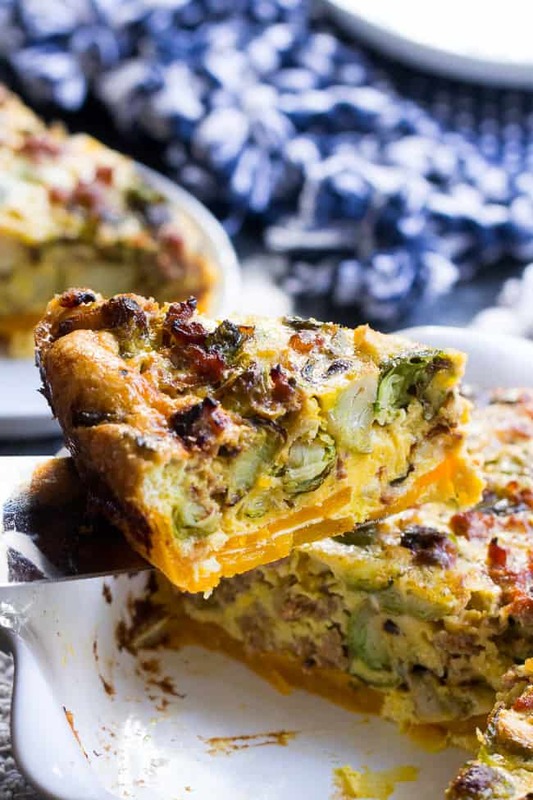 Once it’s time to bake the whole quiche, the egg mixture and the squash form a crust together that adds great flavor, some healthy carbs, and makes the whole thing just a bit more filling, in a good way! A note on the nutritional yeast – it’s Whole30 compliant, and adds “cheesy” flavor to the quiche. However, if you don’t want to use it, it’s not a deal breaker – so no worries if you can’t find it/don’t like it/etc. Are you ready to get started?! Breakfast anytime is the best kind of meal so let’s cook! 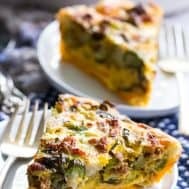 This paleo quiche has an easy butternut squash crust and is packed with sausage, veggies and tons of flavor. 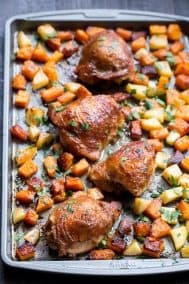 Whole30 compliant and perfect for brunch or any meal. Great as a make-ahead breakfast, too! Peel the squash (I do this with a sharp knife) and chop off the bottom, save for another use if desired. Slice the long part of the squash into 1/4” thick pieces to form the “crust”. Coat your hands in coconut oil and lightly grease the squash slices. Arrange them, slightly overlapping (they’ll shrink) in the bottom of a 9” deep dish pie plate. Cut several in half and arrange on the sides. No need for perfection since you’ll be able to move them around a bit after roasting. 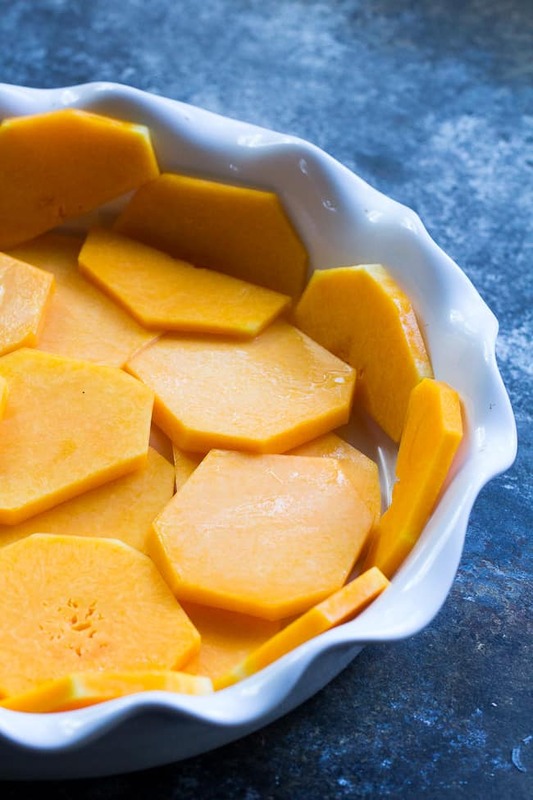 Sprinkle lightly with sea salt and pepper, then place the pie dish in the oven and roast for 30 minutes, or until squash is beginning to brown, remove from oven. Meanwhile, toss the Brussels sprouts with 1 tbsp coconut oil or other cooking fat, sprinkle with a pinch of salt and arrange in a single layer on a baking sheet lined with parchment paper. Roast in the oven (while the squash roasts, too) for 15-20 minutes or until soft and beginning to get crispy. If they appear to burn a bit this is fine - they won’t cook any further past this step. Once roasting is complete, lower oven temp to 400. While the squash and Brussels sprouts roast, heat a medium skillet over medium heat and add the 1 Tbsp coconut oil or ghee. Add the chopped onions and stir to coat. Once soft and translucent, crumble the sausage into the pan and stir, breaking up lumps. Add the pinch of red pepper flakes now, if using. Raise the heat to medium-hi and cook, stirring occasionally, until sausage is browned and crisp and onions are golden brown, then remove from heat. Drain about half the rendered fat from the pan (you want to keep a little) the stir in the roasted Brussels sprouts. In a large mixing bowl, whisk together the eggs, coconut milk, nutritional yeast, and salt until well combined. 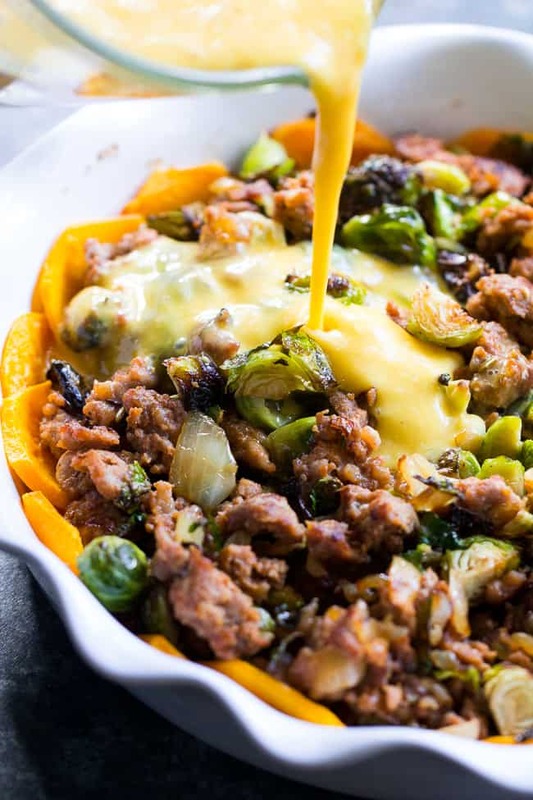 Layer the sausage, onion and Brussels sprouts mixture over the butternut squash in the pie dish, then pour all the egg mixture over the top - expect it to overflow over the “crust” - this is supposed to happen, as the eggs will form the crust along with the butternut squash when baked. Place quiche in the 400 degree oven and bake for 25-30 minutes, until center is set and puffing up and edges just begin to brown. Remove from oven and allow to sit for at least 10 minutes before slicing and serving. Makes 8 servings. *I love this Whole30 compliant pork breakfast sausage from U.S. Wellness Meats! 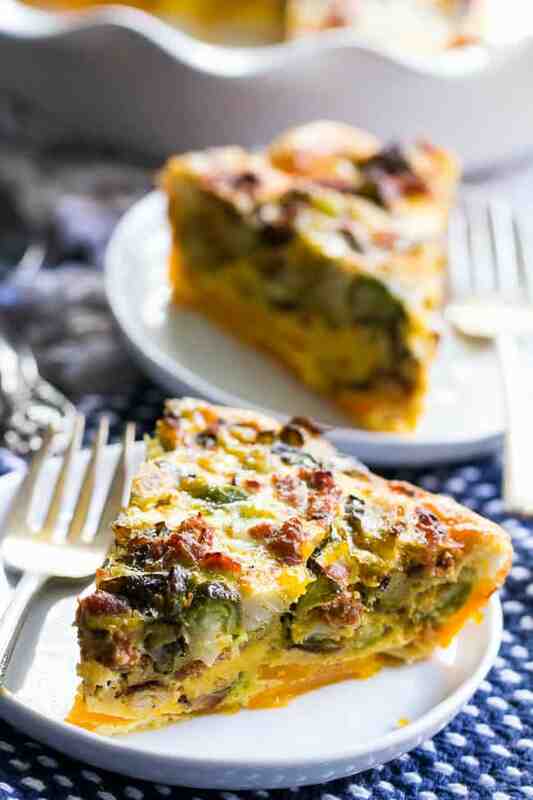 Want More Whole30 Egg Casseroles and Quiches? Try one of these! What do you crave for breakfast most often? Hi, Michele! Sounds wonderful! Do you suppose I can use pumpkin instead of squash for the crust? 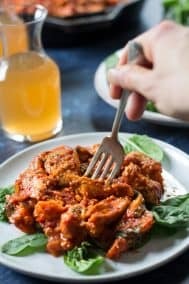 I’m trying to stay on a FODMAPS diet, but this recipe looks amazing! Could you recommend any substitutions for the Brussels sprouts and onions? You could sub leeks for the onions perhaps and maybe something like kale for the Brussels sprouts? Except you’d have to sautéed instead of roast the greens prior to adding to the quiche. 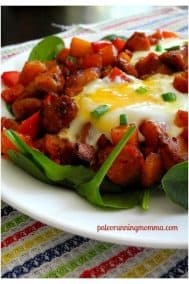 I would like to make this and reheat it all week for breakfast on my whole30. Do you think this would last in the fridge for a 5-7days? You’re goo for 4-5, not sure about 7, you might want to freeze a couple of slices for the last few days. Oh my goodness! This is delicious! I should have looked at your photos again before making as I didn’t use as much of the butternut squash as shown and I baked it a couple min. longer than I should have…but there will be a next time and I can make adjustments. It is absolutely wonderful! Thanks so much for the recipe! So happy you liked it! And yes, the butternut shrinks a lot so you can load it up! Hi Michelle! First I want to say you have been a huge help to me and one of my favorite go-to bloggers as I just completed my first Whole30 and am now transitioning to a paleo lifestyle! 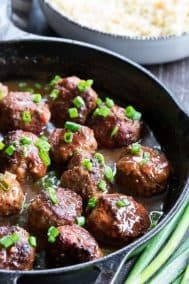 I’ve made many of your recipes and have found you to be a great resource! 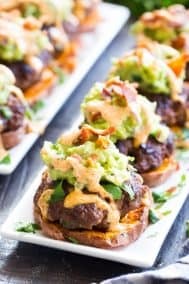 Now- I have a question about this recipe. I’m thinking of making this for Christmas morning and was wondering, do you think it would work for me to make this ahead of time? Ie- put all the ingredients together, freeze and then bake? I’m not sure how the butternut squash would respond to freezing before baking, as well as the egg/coconut milk mixture. I’m thinking you’ll have better luck baking it and then freezing, reheating it covered in aluminum foil the oven when ready to serve. Unfortunately I don’t have a tested answer for you! Happy to hear you’ve been enjoying the recipes! Thanks Michele! I appreciate your thoughts! Hi Michelle! My friend made your recipe and I loved it, so now I’m attempting it myself. Would subbing the butternut squash with sweet potato work do you think? Hi Michelle. I’m going to make this for breakfast (or dinner) soon. I don’t eat sausage (or chicken or beef) I was thinking I could add more veggies. Spinach, mushrooms maybe some broccoli?? What do you think? Can you think of any other veggies that might be good in this? What do u mean slice long part? Cross wise? The long part of the squash, not the bulb containing the seeds. I’m still enjoying butternut squash from this year’s garden, so I made 2 of these yesterday, one with sausage and one without (for the vegetarians), and served them at my annual Alumni Brunch. It was delicious, and my students loved it too! Thanks so much!